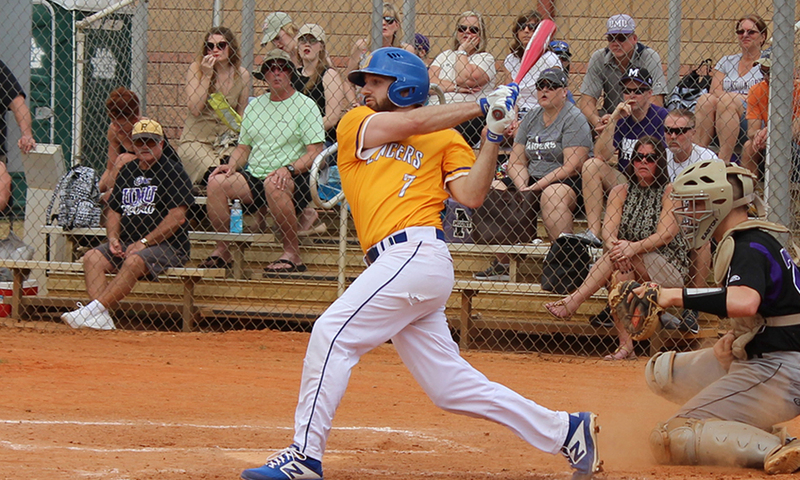 Worcester State baseball got off to a great start to the season, going 6-2 on its annual trip to Florida and winning seven games in a row to open the season with only two losses in the opening nine games. While the Lancers have come back down to Earth a little, with only two wins in their last eight games, senior outfielder Mike Ferrara continues to put up huge numbers. The Oliver Ames grad and former HockomockSports.com First Teamer is batting .421 and has a hit in all but three games for the Lancers this season. This comes as no surprise to people who watched him set a single-season hit record for the Tigers during his senior year, when he recorded 37 hits in the 2015 season, finishing with a .521 average. Hitting has always been Ferrara’s forte, but this season he has been on fire at the plate right from the start of spring. When he was asked about the Lancers getting off to a strong start this spring, Ferrara pointed to the preparation that the team put in during the off-season. Starting with fall ball and into the winter, the team has been getting ready to turn around a disappointing 2018, in which the Lancers were 12-26, and get back to the levels of 2017 where Worcester State got hot late in the season and won the MASCAC tournament title. While things slipped a little for the team, Ferrara continues to rake. He leads the team in average (.421), slugging (.684), and RBI (15). He is also second in stolen bases (six) and runs scored (13) and third in on-base percentage (.485) and walks (eight) entering a two-game weekend set with Bridgewater State. Ferrara said that he has kept essentially the same approach since high school. He continues to train in the winter with Terence O’Malley of TJO Sports in Canton, just like he has since his sophomore year at OA, and goes into each at-bat focused on her timing. Being comfortable at the plate is critical to succeed against college-level pitching and Ferrara seems to have found his groove. He went hitless in the season opener against Mount Union in Kissimmee, Fla. and then got at least one hit in nine straight games, highlighted by a 4-for-6 game against Keene State that earned him MASCAC Player of the Week honors. After going hitless in back-to-back games against WPI and Westfield State, Ferrara is back on track. He has two hits in each of his last four games, although he only has one RBI in the last seven games after 14 in his first nine. Two years ago, the Lancers went on a run through the conference tournament, beating Framingham State 10-3 and 1-0 in the final series to book a spot in the NCAA tournament. While that was fun as a sophomore, getting back to that stage as a senior would be particularly special. As the Lancers enter April, the games start to come thick and fast and the season turns into a grind to try and move up the conference standings. There may only be a few days off and it takes a lot of work to balance life, school, and baseball, Ferrara is never going to pass up the chance to play baseball every day. Ferrara said, “Bodies are tired, arms are getting short, but you’ve got to put it together. Just knowing that you’re waking up playing a baseball game, there’s nothing better, especially once everyone’s fired up for conference it gets even better. Below is an update on former Hockomock League baseball athletes currently competing in collegiate sports. 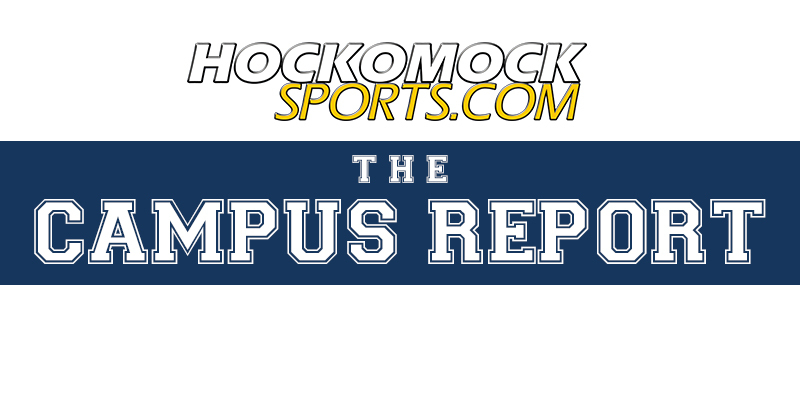 If you would like to submit an update, please e-mail info@HockomockSports.com. The long list of accomplishments for Oliver Ames graduate David MacKinnon continues to grow. MacKinnon, who broke Hartford’s hit record as a sophomore year and then broke his own mark again this year, was tabbed as the America East Baseball Player of the Year. MacKinnon becomes the first Hartford player to earn this honor. An All Conference second team selection for the past two seasons, MacKinnon made it clear he was the top player this season. Entering the America East tournament, he led the conference in hitting (.390) and runs (54). He was fifth in the conference in slugging (.537), second in on-base percentage (.467) third in doubles (15) and eighth in triples (3). He finished the regular season with 80 hits, smashing his program record of 68 from a year ago. He has already added to that, going 4-5 in Hartford’s opening game in the conference tournament. MacKinnon drove in four runs, including the tying run in the bottom of the ninth inning. The Hawks went on to walk off in the 10th inning. He also had a two-run home run in the game. MacKinnon wasn’t the only Hockomock representative honored in America East’s conference honors. 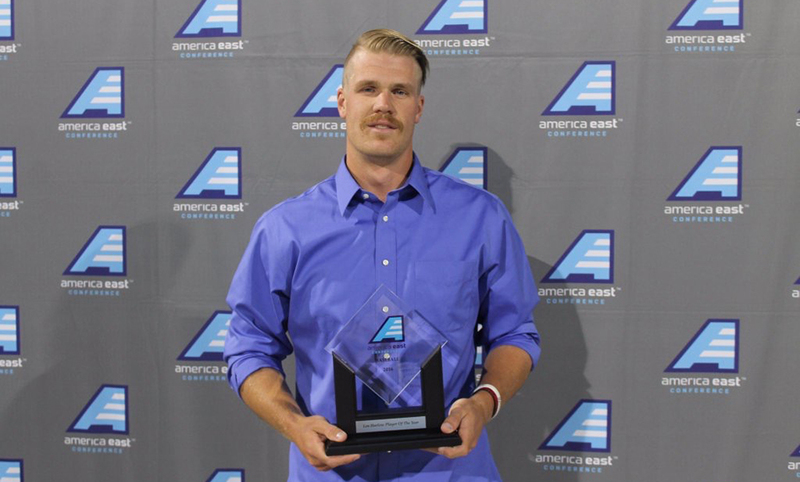 Another former Hockomock League MVP, Franklin’s Brendan Skidmore, was selected to the America East All Conference Second team at first base. Entering the America East playoffs, he leads Binghamton with nine home runs (third in the conference) and 14 multi-RBI games, hitting .345 in conference play with 39 RBI for the season. Skidmore and MacKinnon, the two top first basemen in the conference, will face off on Friday as Hartford and Binghamton play at 12:00 noon at LeLacheur Park in Lowell. A pair of former Hockomock players had their collegiate careers come to a close after successful stints with Bridgewater State. Oliver Ames’ David Holmes had the best record for the Bears’ pitching staff at 5-1, posting a 2.94 ERA and a team-best 38 strikeouts. Holmes limited opponents to a .261 average with just nine walks on the year. Taunton’s Travis Ritchie started and played in all but one game this year, posting a .282 average, good for fifth on the team while being second on the team in hits with 35. Ritchie tied for the team lead in triples and was one of the Bears’ best fielders (.987%) in the outfield. Both Holmes and Ritcher were selected to the MASCAC Second Team. Sharon graduate Ryan Riley made 11 appearances for Clarkson this season, the second most of any pitcher, with all of them coming in relief situations. Riley posted a 2-1 record in 22 innings of work, striking out 18 and limiting opposing batters to a .250 ERA. Riley posted a 3.97 his freshman year on the bump for the Golden Knights. Former Milford Scarlet Hawk JJ Branch emerged as Endicott’s go-to pitcher and ace this season. Branch started in a team-high 12 games, pitching 77.2 innings (over 30 more than the next pitcher on the staff) and posted an impressive 7-1 record. Branch had a team-low ERA of 2.43 for starting pitchers and fanned 49 batters, also a team best. A pair of former Hockomock rivals turned teammates helped Keene State get their most wins since the 2013 season. Foxboro’s Connor Longley had the fourth most at-bats for the Owls during his freshman year, batting .277 with 38 hits and a pair of home runs. Sharon’s Nate Pederson made 10 appearances in relief, throwing 13.2 innings with six strikeouts. Former North Attleboro standout Justin Gallagher was a valuable asset to Wheaton’s bullpen this year. Gallagher made 13 appearances in total, all in relief, helping the Lyons to another successful season. He posted a 2.08 ERA second on the team by pitchers who made at least 10 appearances. He struck out 11 with just three earned runs allowed this season. Lesley University’s baseball team posted 19 wins this season and two former Hock players had a lot to do with it. Milford grad Bryan Hildebrand was tied for second on the team with three wins, starting four games and appearing four times in relief. The former Scarlet Hawk walk just nine batters in over 25 innings of work. Former Foxboro Warrior Mike Slaby was the Lynx’s top offensive option, leading the team with a .361 batting average, 44 hits and two triples. He was second on the team with 18 RBI and had a .451 on-base percentage. Fresh off a terrific senior year at Oliver Ames, Mike Ferrara made an immediate impact at Worcester State during his rookie season. He played in all 39 of the Lancers’ games this season and had 139 at-bats, fourth most on the team. Ferrara batted .281 with 39 total hits, including four doubles and a home run. He had 15 RBI, fifth on the team, and stole four bases. Connor Johnson has been one of Maine head coach Steve Trimper’s top choices in the bullpen this season. The Taunton alum had made a program-high 19 appearances, all in relief, this season for the Bears. Johnson posted a 4-4 record with a 3.93 ERA, striking out 35 batters in 34.1 innings of work. Johnson is one of a just a few pitchers in the conference to be able to retire MacKinnon in two straight at-bats this season. MIT baseball claimed the ECAC New England Division III Baseball Championship earlier this month with former HockomockSports.com Player of the Year Max Lancaster playing the role of catalyst. Lancester, an Attleboro grad, helped spark the Engineers’ eight run seventh inning. Lancaster had a two RBI single down the left field line to score the first two runs of the rally. Lancaster doubled the amount of games he played in this season compared to his freshman campaign. He batted .266 with 23 RBI, 18 runs scored, four stolen bases and three home runs. Attleboro alum Matt Elliot concluded a strong first season for Anna Maria, finishing third on the team with a .306 batting average. Elliot, who had eight hits in a four game span at the end of the season, finished in the top 30 in the Great Northeast Athletic Conference in batting average, was second on the team in doubles and stolen bases and led the Amcats with three triples. There are a lot of reasons that Nichols baseball was able to post 24 wins this season but North Attleboro’s Matt Hardy was one of the big ones. Hardy started all 42 of the team’s games and batted a team-best .391 on the year with 11 doubles and 26 runs batted in. Hardy had 63 hits this season and scored 31 runs. While patrolling left field, Hardy had a .938 field percentage and finished the season with 12 straight games without an error. Former Milford starter Cam Cossette made nine appearances for Plymouth State this season, five of them starts. Cosette struck out 27 in 31.2 innings of work, posting a 2-1 record on the season. Cossette struck a season-best six batters on two occasions, in a big win over Rivier in April and a close lost to Lyndon State in May. A pair of Franklin Panthers turned Saint Anselm Hawks had strong seasons on the mound. Tyler Buck was unlucky to not get a win in his senior year in 44.1 innings of work. In six starts and eight overall appearances, Buck struck out 18 with a 4.47 ERA and also recorded a save. Zane Byrne made 12 appearances in his rookie season for Saint A’s, all in relief. He tossed 23.1 innings with 16 strikeouts, posting a 4.63 ERA for the year. The accolades continue to roll in for Sharon alum Jake Fishman. 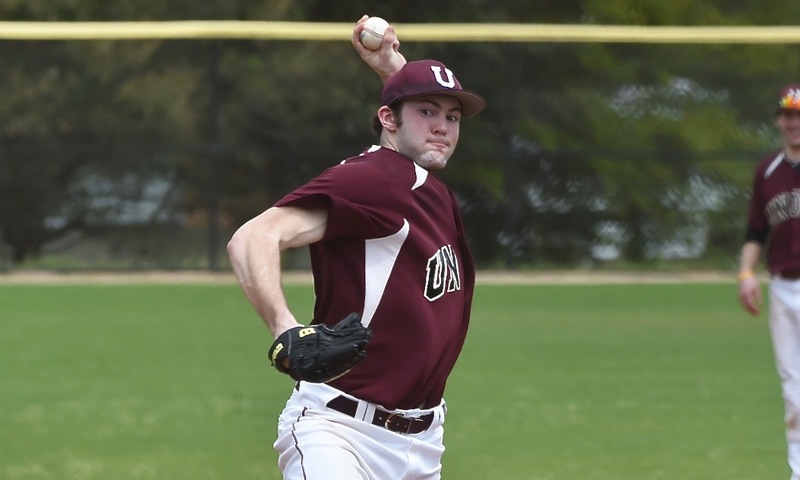 Now starring at Union College, Fishman was recently named to the ABCA/Rawlings NCAA Div. III New York All-Region Team and the D3Baseball.com All-New York Region Team. He was selected as a First Team Utility player on the ABCA team and was chosen as one of three starting pitchers on the D3Baseball.com First Team. He batted .361, had 14 RBI and led the team in hits (48) and runs scored (29). On the mound, the Liberty League Player of the Year was 7-0 with a 0.41 ERA. Fishman will be playing with the Wareham Gatemen in the Cape Cod Baseball League this summer. The University of Rhode Island baseball team is playing in the A-10 semifinal on Friday and two Hockomock alums could be in the mix. Ryan Olmo, a former star at Attleboro High, will likely be patrolling the outfield. So far this season, he’s batted .260 this season with 51 games played. He’s third on the team with 31 RBI and has recorded 12 doubles as well as a home run. Canton’s Sam Larson, a red shirt freshman, has made just one appearance this year. He made the most of it though, throwing two scoreless innings against UConn. Matt Nunes had a strong bounce back year at Westfield State after being hampered by an injury last year. Nunes tossed 31 innings this year, starting five games and making eight total appearances. He posted a 3-1 record and had a save on the season, striking out a 35 batters – good for second on the team. He held opponents to a .240 batting average over the course of the year. Two former Hockomock players made their mark on Salve Regina’s very successful season. The Seahawks advanced to the second round of the NCAA tournament before concluding their season. Canton’s Jimmy Fitzgerald, a sophomore, made five starts and nine overall appearances. In 33.2 innings, he fanned 37 batters and allowed 10 walks while posting a 3-1 record with a save. Sharon graduate Will Ginsberg made eight appearances with half of them being starts. He went 1-0 with 19.1 innings of work, striking out 17 batters. NORTH EASTON, Mass. 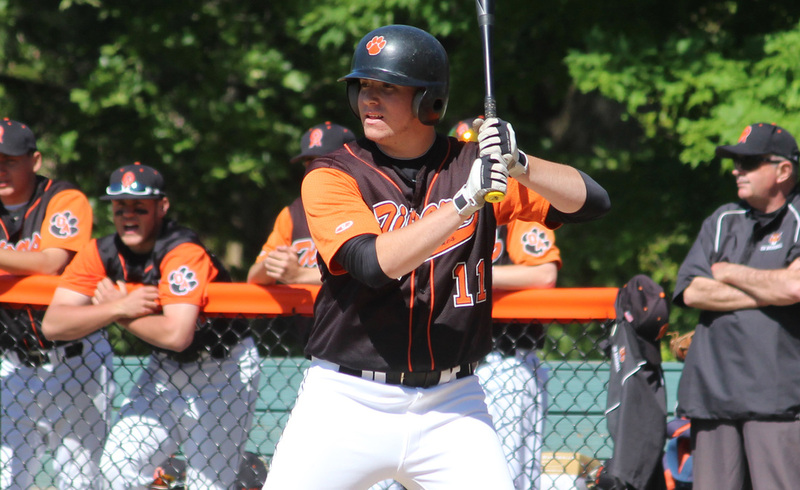 – Oliver Ames broke open a tie game with three runs in the bottom of the sixth inning and junior Brendan Welch tossed a complete game as the Tigers beat Milton, 5-2, to advance to the MIAA D2 South Quarterfinals. The fourth-seeded Tigers fell behind 2-0 in the top third inning but leveled the score with two runs of their own in the bottom of the fourth. A three run sixth inning gave Oliver Ames the lead for good while Welch allowed just two hits on the day and struck out five. With the game tied 2-2, OA senior catcher Joe Walsh ripped the second pitch he saw deep into left center field, into the trees at Frothingham Park, for a lead off triple. With the infield playing in, OA second baseman Adam Burr grounded a single up the middle to score Walsh to make it 3-2. Nolan Edwards then took an 0-2 count and roped a double into left field, scoring pinch runner Andrew Perron from first to make it 4-2. Shortstop Brian Holmes executed his second sacrifice bunt of the game to move Edwards over to third base and center fielder Mike Ferrara hit a sacrifice fly to center field to play Edwards for a 5-2 lead. Welch struck out junior Jason Turner to start the top of the seventh and then induced back-to-back ground outs from Chris Cullen and Connor Shea to end the game. The Wildcats took the lead in the third inning on the only two hits they had all game. Number eight hitter Alex Toyias singled up the middle just out of the reach of Holmes to lead off the inning. It looked as though Toyias was picked off at first but was called safe. The next pitch, Milton’s number nine hitter John Lawton ripped a double into left field to plate Toyias to go up 1-0. At the next at-bat, lead off man and pitcher Colin McCabe hit a grounder to second, but the ball eluded Burr for an error and Lawton scored from second to make it 2-0. It looked as though the Tigers would get at least a run back in the bottom half of the inning, but were unable to push a run across. Holmes led off with a single into center – a play originally ruled as an out on a diving catch in center, but overturned after Duggan came out to question – and Ferrera and Romero followed up with singles to load the bases with no outs. But McCabe got Welch to strikeout looking and then induced pop ups from David Romero and Alex Geba to protect the 2-0 lead. But in the bottom of the fourth, Oliver Ames knotted the score at two. Burr atoned for his error in the third inning with a single in the fourth. Edwards followed with a grounder to third, but Chris Cullen’s throw to second to try and turn two sailed just wide and into the outfield, as Burr advanced to third. Holmes’ first sac bunt of the game came next, moving Edwards to second before Ferrara – the Hockomock League’s RBI leader – singled into left field to score both Burr and Edwards to tie the game 2-2. After giving up the two hits in the third inning, Welch allowed just one base runner – his lone walk of the game to lead off the fifth – for the rest of the game. He needed just 38 pitches over the last four innings to shut Milton down and tallied four of his five strikeouts. Ferrara finished 2-2 with three RBI, Walsh went 1-3 with a triple and run scored, Burr was 2-3 with an RBI and a run, Edwards was 1-2 with two runs and Holmes was 1-1 with two sac bunts which both turned into runs. Oliver Ames advances to play fifth-seeded Duxbury in the D2 South Quarterfinals. The Dragons took down Stoughton, 9-8 in the First Round. The game is currently schedule for Monday, June 2nd at 4:00 according to the MIAA website.